Terry Asp works in Microsoft Word on his iPad. But he can’t insert a photo from his Dropbox account into Word. In fact, he can’t insert one from his OneDrive account, either. 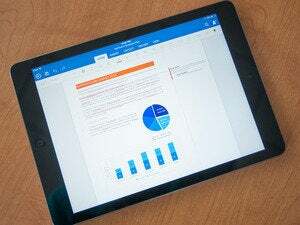 If you’re using the current versions of Word, Excel, or PowerPoint on your iPad (but not, unfortunately, OneNote), you can easily open a file that’s residing on your PC—assuming it’s stored in your PC’s Dropbox or OneDrive folder. Once you’ve set it up, your online storage service of choice is just one of the locations in your app’s File screen. But if you want to insert a picture into your document, spreadsheet, or slideshow, those locations aren’t part of the equation. There’s no way to get to your cloud-based photos. The same problem applies if you choose to skip the apps and use the online versions of Office in your iPad’s browser. But there too, you can’t insert an image stored online without using the trick below. 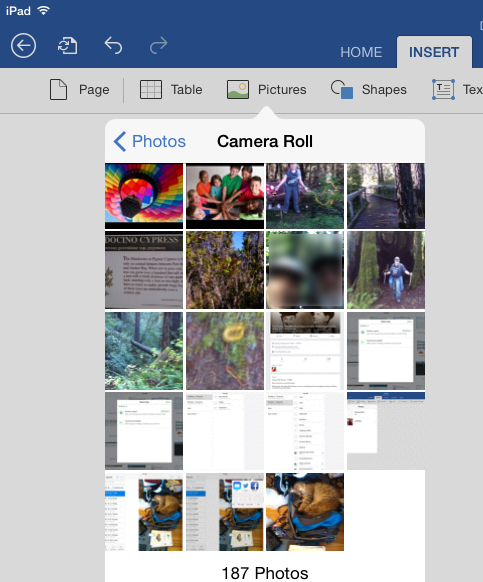 First, open your iPad’s Dropbox or OneDrive app, and select the desired photo. If you’re using Dropbox, tap the export icon near top-right corner and select Save Image. If you’re using OneDrive, tap the export icon near the bottom-left corner, and select Send File>Save Image. Whichever one you use, if you’re asked for permission to access your photos, give it. Now the image is in your iPad’s photo gallery—specifically, in the Camera Roll. From there, you can insert it into any of the Office apps. In fact, you can insert it into any apps that use images. Back in your Office app, tap the Insert tab, then Pictures. Select the Camera Roll, and the picture will appear at the bottom of the images. Select it and it will insert itself into your document, spreadsheet, or slideshow. But why do you have to put up with this kludge? Sync and storage services like Dropbox and OneDrive have always been a bit clunky in iOS. The services don’t integrate into the file system the way they do in Windows (or on a Mac). To properly sync with these services in iOS, your app must support the service you’re using. Not surprisingly, the iOS Office apps supported Microsoft’s own OneDrive from the start. Support for Dropbox came later. And with both services, support doesn’t extend to inserting images. Hopefully, in the future, it will.